I would love to get to know you better, so I invite you to introduce yourself to me following one of our worship services. However, I also invite you to attend a lunch connection with me. 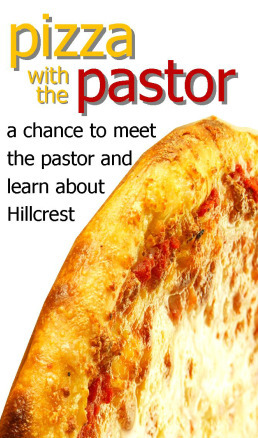 I call them Pizza with the Pastor! Here at this gathering I would love to eat lunch with you and your family and get to know you better. We will have pizza and or other food and have an opportunity to meet other people and have a conversation about things I think are important. The lunch should about an hour. To help our conversation together, we will have a different discipleship theme as the focus of our conversation (The values and visions of Hillcrest, why membership matters, the marks of maturity, discovering your gifts, and how to share your faith). But my real hope is to share my personal passions and joys and to learn yours as well. This lunch is open to first time attendees as well as long time members.